Lake Tahoe, Calif. – Elena Hight’s fourth and final webisode in her new series entitled New Hights is now live online. The four-webisode series was produced by Rockstar Energy and follows Hight during her 2013 winter season, from rehabbing a hip injury to creating history in women’s snowboarding with a groundbreaking trick in the halfpipe at X Games Aspen. 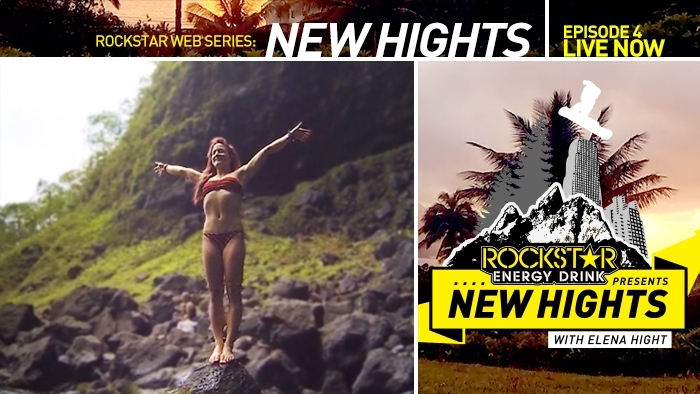 Episode four entitled “Back to the Roots” follows Hight as she travels back to her homeland of Kauai, Hawaii, where she lived until she was six and moved to the mountains. A heartwarming interview with her father, Mike Kuntz, is highlighted where he identifies his daughter’s athletic prowess at age one. The final episode in this series is especially intimate as she surfs, paddleboards and decompresses with her family and friends after a long season of professional snowboarding.